What’s that Look on Your Face? 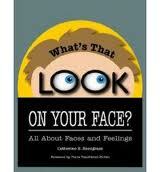 All About Faces and Feelings by Catherine Snodgrass. This book helps give illustrations along with scenarios so children on the spectrum can learn to recognize a wide variety of facial expressions and learn to connect them to specific feelings. Each feeling is given a short poem as a learning tool. Pp. 29.